The best examples of modern games that tap into the nostalgia of old are those that are styled “retro,” but don't ignore all the learnings that has come from a few decades of game development. Octopath Traveler is the shining example of what every developer of “modern retro” should aim for. Related reading: This game is inspired heavily on the Bravely series on the Nintendo 3DS. 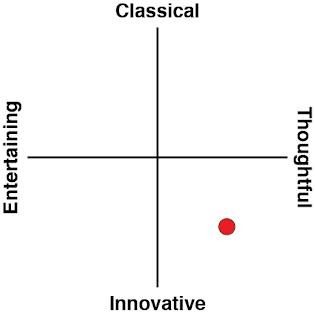 Here's our review of one of them. You only need to take a look at any screenshot to know that this game is one glorious, gorgeous, decadent homage to the mighty JRPGs of the 16-big era. 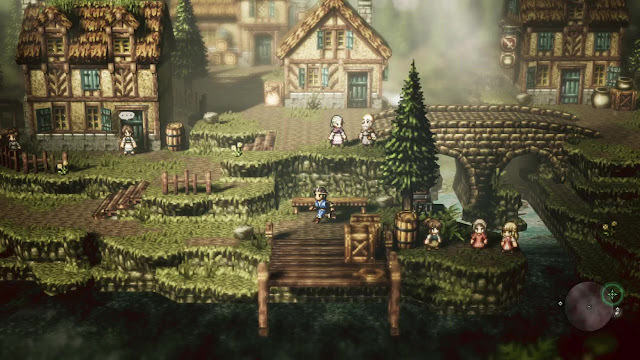 Just as we were absolutely mesmerised by the colour, vibrancy, and spectacular vision of the Final Fantasies and Dragon Quests that were released on the SNES, so too is Octopath Traveler one visionary example of how simple pixels, drawn with care, can really immerse a player in its world. This sometimes comes at a cost; playing the game on the (relatively) small Nintendo Switch screen makes it difficult to navigate the world at points. So lavish is the level of detail in every square inch of the screen that sometimes I struggled to make out where the paths were to navigate through the world, let alone find those cleverly-hidden paths that led to treasure chests. In an odd way, that was nostalgic, too – remember walking up against every wall in Final Fantasy IV or VI, knowing full well that at least a few of them were fake walls that led to the very best loot? There’s something of a sense of that in playing Octopath Traveler too. Beyond that, though, mild inconveniences like not knowing which path to follow are well worth putting up with for the stunning artistic vision that this game offers. I often argue that the technical side of video games is irrelevant; sure Kratos’ biceps are rendered well, and of course Ubisoft does an impressive job filling massive open worlds with stuff, but really, what I actually want to see with my eyes is abstracted beauty; art design that tantilises, intrigues, and kicks the imagination into high gear. For me, that’s Octopath Traveler. I haven’t played a more beautiful game in years. Were Octopath Traveler just the extension of classic sprite-based JRPG action, I imagine I would have put it down well before actually finishing it. I love my old JRPGs, of course, but I'm busy enough these days that I'd rather not spend 80-odd hours in one that can't push past tradition. But in practice, Octopath's storytelling is that much more refined, nuanced, and mature that the classics that it draws inspiration from. Its greatest defining feature is the way it introduces characters. At the start, you’re given the option of choosing any one character from the cast. At that point you lock yourself out of all the other characters, until you’ve completed an introductory story, dungeon, and boss battle. 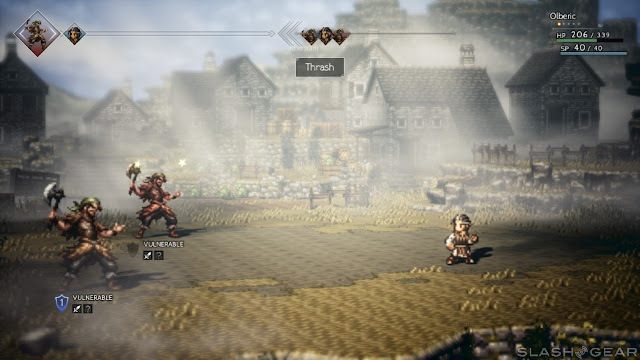 Then Octopath Traveler opens up, letting you visit the communities of each of the other heroes, in any order, and then experiencing their stories before having them ultimately join your team. 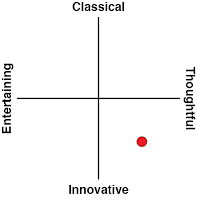 This structure allows you to spend the time to get to know each and every character properly, and independently of their role within the broader group. In so many JRPGs – particularly the classics, the story is told exclusively from the perspective of one or two main characters. Each of the supplementary characters in those titles was reduced to little more than their mechanical role in combat or are there as motivation to push the main protagonists along. Even the mighty Final Fantasy VI, for all its moments of narrative brilliance, had a significant number of meekly supplemental characters that were never given more than the most passing of treatment. Octopath Traveler neatly sidesteps that through its structure so every character has genuine purpose, emotion, and motivations within their arcs. It results in a behemoth of an overall narrative that is every bit as unwieldy as other works in which the author insists on giving every character a proper arc (Game of Thrones, anyone? ), but it works. As long as you’ve got patience for the game, you’re in for some of the most potent characters you’ll ever have experienced in a JRPG. It’s nice that they’ve all got abilities unique to them outside of combat, too, and each time you add a new character to the team, you’ll want to go backtracking and see how that new character can interact with the people of previous towns. 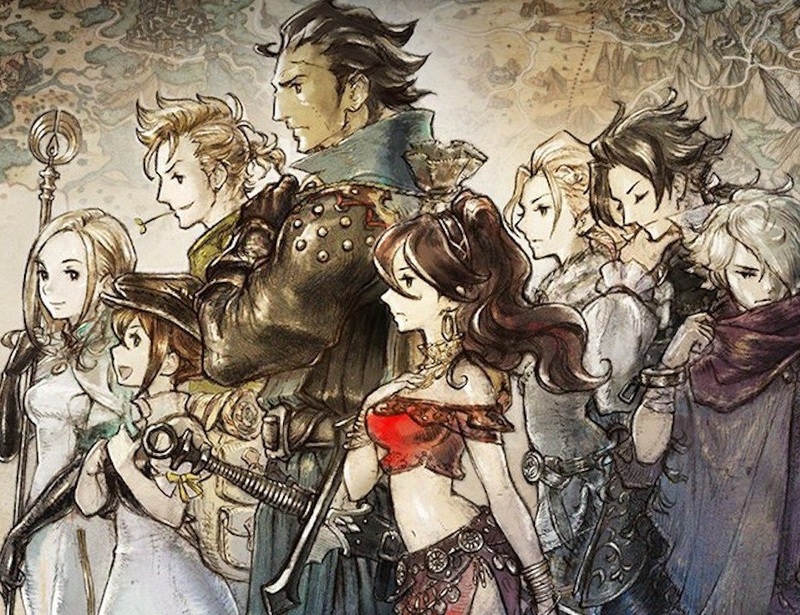 Coupled with the side quest structure, it’s easy to get very lost in doing everything but the main task in those early stages of the game (that task being adding all the other characters to your party), and somehow Octopath feels open, despite being far more linear than any open would game you might have played. This openness is further exemplified by the way that your team’s reputation in areas can fluctuate based on your actions. That, coupled with who is in your party, can affect storytelling moments, and the number of combinations and permutations in the game mean that if you want to experience absolutely everything, you are in for one mountain of content to climb. The best bit about that, though, is that unlike in 99 per cent of other games, none of it feels shovelled in there simply to increase the length of the game. Every moment goes to building up the very personal stories of each of the characters, and, ultimately, making you care. Many of the stories are surprisingly dark, too, so the fact that they’re personal stories means they hit all the harder. And this really is a game that isn’t afraid to hit hard, and present players with a hostile world to overcome. Subtly, you’re being led to feel like the small band of heroes are always up against it; major enemies (even regular humans) absolutely dwarf the heroes in the turn-based boss battles, for example. Random combat scenes happen at just the right frequency that you’ll wonder about pushing on into unexplored areas, and you’ll certainly learn to be wary of areas where the “threat level” is listed as high. I wouldn’t say that Octopath Traveler is unnecessarily difficult (aside from the boss that you’ll need to take on with your very first character choice, because you'll have to do it with a single character then), but at the same time, it’s not a game afraid of punishing mistakes. Ultimately, Octopath Traveler is a game about journeys. Not one, but multiple, and how those journeys can intersect with the stories of others. Of how complete strangers might find themselves risking life and limb for a greater cause none of them knew they were being wrapped up into. So many other JRPGs – especially older examples of the genre – focus the story on a group of heroes against a Big Bad. 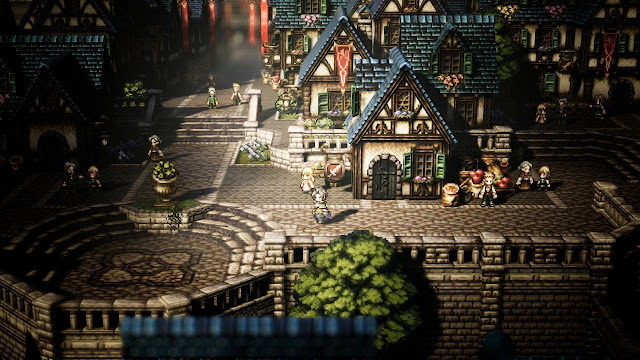 Octopath focuses the story on the characters, and that tonal shift is nothing short of a delight. The combat system could have been pulled directly from a Bravely Default sequel. Which is not a complaint on any level. Characters are able to undertake a single activity in a turn, or alternatively they can spend “boost points” which are earned at the rate of one per turn to attack multiple times in a go. Each character has different weapon specialties, and each enemy has specific weaknesses. Doing well at Octopath involves figuring out the weaknesses and then hitting them with those attacks often enough to “stun” the enemy, which then allows you to wallop them with powerful attacks that do extra damage for a turn. The combat system is a careful balance between resource management (those boost points are precious), a war of attrition, and smart timing. You want to save your best attacks for when the opponent is stunned, but at the same time, letting that opponent demolish your party with their own powerful attacks while you structure yourself strategically is a quick way to a game over. The consequence of this combat system is that battles tend to go overlong, and there were times that I was up against bosses that I wasn’t sure I could actually defeat, because there simply seemed to be no end of the enemy’s health (and the game has no way of visually indicating to you that the boss is in a weakened state, or closing in on death. But again, that is a really minor complaint when stacked up against the vision. Octopath Traveler is a beautiful game that somehow never gets tired. It has a labyrinthine plot that bravely attempts to give eight characters the same scope and development as eight sole protagonists would get in lesser games. It’s also a game that bravely makes the story all about those characters, with the world, harsh as it can be, almost secondary to the insular unit and their individual arcs. 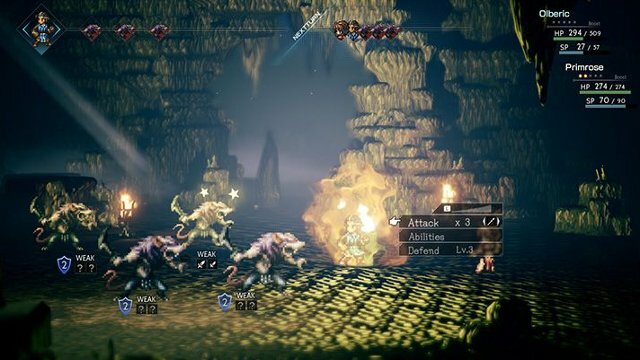 That sheer ambition is all the more impressive because Octopath Traveler uses sprites. Little 2D characters made up of even littler squares. People need to play this game if only to realise that not everything spectacular needs to be photo-real.